European VW owners "have no clarity about when their cars will be fixed," say lawyers. FRANKFURT/LONDON -- European owners of Volkswagen cars read the details of a deal to compensate U.S. drivers for the diesel-emissions scandal with frustration as their wait for settlement enters its eighth month. VW has said about 11 million cars worldwide were fitted with software to cheat diesel-emissions tests that are designed to limit NOx emissions blamed for respiratory diseases and pollution. In contrast, VW promised drivers in Europe, where emissions limits are more lax and where many drivers bought the cars for the German manufacturer's green credentials, a quick software fix from January that it said could even make their cars more efficient. But with Germany's Federal Motor Transport Authority (KBA) still examining the plan - and other authorities still investigating - a solution is elusive. The KBA has currently only approved fixes for about 100,000 vehicles from the 8.5 million affected in Europe. "European VW owners now have no clarity about when their cars will be fixed, as the timetable that was originally published is out of time now," said one UK lawyer, who is representing thousands of UK drivers. "And all the time, people are trying to sell their cars and saying anecdotally they are not selling them for as much as hoped ... It is annoying." Companies facing lawsuits are under greater pressure to reach a settlement in the U.S. because of far greater potential legal costs. VW said it was focused on all of its customers. "To us, the customer is always key. We are taking care of every customer. In the U.S., circumstances are more complex and emission rules stricter than in Europe and the rest of the world," a spokesman said in emailed comments. "We are currently working on a package for all affected markets and customers to make the refitting [of cars] as pleasant as possible for our customers," he said. German and UK lawyers, representing thousands of European drivers, said on Thursday their clients deserved the same deal. "It cannot be that German clients are treated as second-class clients," said Julius Reiter, a lawyer with Duesseldorf-based firm Baum Reiter & Collegen. "They are the backbone of the company." 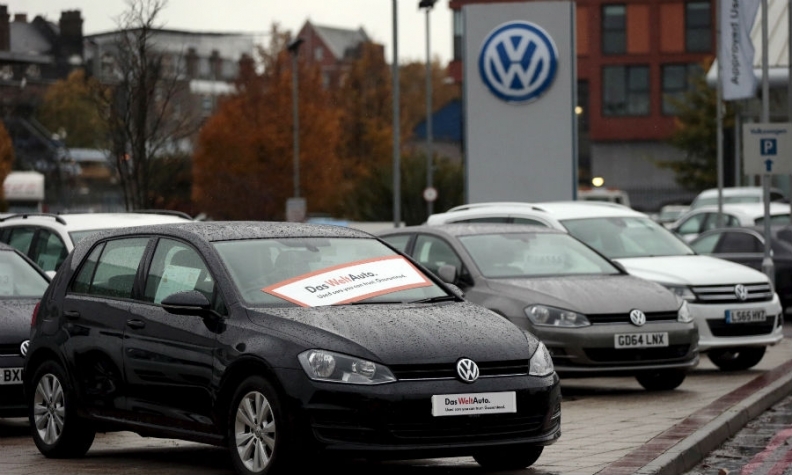 Lawyers in the UK, who have been writing to VW for over six months asking for reparations for customers, said the U.S. deal strengthened the resolve of their clients to battle for redress. Bozena Michalowska, a partner at law firm Leigh Day who has been contacted by more than 9,500 UK drivers, said she expected to file a lawsuit "probably within a month" on behalf of clients who she said were being treated with contempt. "Why are vehicle owners in the UK being treated differently?" she asked. "The majority of our clients chose their car because of its environmental credentials. They are angry that they have been lied to." Klaus Mueller, the head of the Federation of German Consumer Organizations (VZBV), also urged VW to either buy back affected German cars or offer consumers damages of 1,000 euros ($1,140). VW also faces a handful of investor lawsuits in Europe that allege, in part, that it failed to publish market sensitive information in a timely way. VW has blamed the scandal on a small group of low-level employees and has said it believes its management board fulfilled its disclosure obligations under German capital markets law and that German investor lawsuits are without merit.